The release of Both Directions at Once: The Lost Album and its reception say a lot about the current state of the record business and the current state of jazz. It debuted at No. 21 on the Billboard Top 200 and was No. 1 on both the Traditional Jazz and Jazz charts. For me, the most remarkable thing about those figures is that they came from Forbes, a financial magazine, not some place I’d expect to read about a Coltrane record. 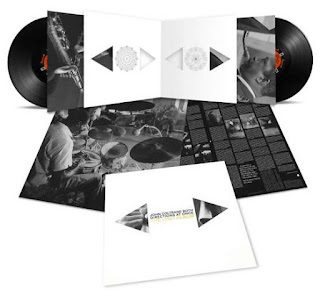 The figures highlight the need for iconic creative figures in jazz at a time when the “business” is focused on “sophisticated” easy listening, while the creative energies of improvised music—in part the legacy of John Coltrane—live vigorously outside the marketplace. Fifty-five years after the fact, it testifies to the ability of four musicians to track an hour and a half of music in a single session, and the ongoing desire for physical media (It’s available as CD or LP and in a deluxe edition with an additional CD or LP of alternate takes). It also suggests a surfeited audience that can grasp at another example of a single dead artist’s work while missing so much of what’s currently going on. Coltrane’s quartet conception was incredibly important in jazz, and not just because it went in “both directions at once,” but because it went in numerous directions “at once.” In the late ‘50s jazz was in a period of tremendous ferment, creatively developing both its own resources and its social meaning, increasingly turning to different forms of blues, gospel, social protest and experimentation. You hear it most explicitly in the music of Charles Mingus, Max Roach and Sonny Rollins—you were getting jazz that was being reshaped by a changing consciousness, from the civil rights movement to the sudden availability of world music recordings. What Coltrane developed in the quartet was depth experience, and it came in two forms: one was the absolutely exploratory side of his tenor playing, the long solos that stretched to the limits of density, velocity and intensity (e.g. the 1961 Village Vanguard “Impressions” and “Chasin’ the Trane,” the latter listened to closely to the end, so that after the 16-minute onslaught you hear the single-note cheer from Eric Dolphy’s alto); the flip-side of that was the drone-based soprano saxophone music that was a kind of homing-in: the resemblance of the instrumental roles in “My Favorite Things,” for example, where the band is virtually drawing an absolute connection between the dynamics of a jazz group and the spreading calm of Indian classical music, which is built around a dialogue between a melodic instrument and drums with an accompanying drone that centers that dialogue. Part of the greatness of Trane was his willingness to go on forever, making a set a single tune. The quartet complemented that drive and its particular form: it was all about insistence: bassist Jimmy Garrison’s pulse, pianist McCoy Tyner’s reductive chordal repetition and drummer Elvin Jones’ polyrhythms, the way he could press ahead and backwards at the same time. The Coltrane quartet was a pressure cooker, a machine for intensity, a house of intensity in which Coltrane could express his own sense of pressure which was also the pressure of the time—both terrifying and ecstatic. In recent times you get bands that are much more “free” in their approach to structures, but which rearrange that sense of creative pressure—like the late David S. Ware’s quartet with Matt Shipp and William Parker, or the trio of Evan Parker, Barry Guy and Paul Lytton. In free jazz rich Lisbon, musicians like Rodrigo Amado’s Motion Trio and the Red Trio are long-range developments of that kind of focussed intensity. When the musical pressure in the Coltrane quartet became too great it blew apart, becoming something else, the final quintet, with appropriate valves and openings. Both Directions at Once: The Lost Album, in the two-CD version, is about 90 minutes of music recorded in a single day, intense, complex, coiling music with multiple takes of two untitled originals and short studio versions of pieces well known from long live or later recordings, “Impressions,” “Nature Boy” and “One Up, One Down.” It’s an intimate look at Coltrane’s creative process in the studio, the different approaches to the same material, and the way he was always finding new ways to put the music together. The longest track, the 11-minute “Slow Blues,” is literally multi-dimensional in the way it both directly invokes the expressive tradition of blues and the way in which Coltrane will suddenly insert twisted, harmonically-outside phrases, so that it’s literally two blues at once, one deeply traditional, one highly personal. One of the things the Lost Album highlights is the operations of record companies in the history of jazz. While Both Directions at Once represents Coltrane’s demanding, deeply personal art, Impulse Records much preferred to market him as a mainstream artist, literally one who played brief renditions of familiar tunes, sometimes with only melodically decorative variations. The previous studio sessions to Both Directions at Once that were released immediately were Ballads and Duke Ellington & John Coltrane; Coltrane and the quartet recorded Both Directions at Once on March 6, 1963; the next day, they were back in the studio to record John Coltrane & Johnny Hartman, with the great neglected, jazz balladeer. These are all beautiful records, but they’re also virtually “easy listening” music (I mean nothing pejorative by this: it’s a broad category that describes an experience rather than an art: depending on use Scarlatti, Mozart, Debussy and Ellington can function as “easy listening music”). My point, rather, is that Both Directions at Once reflects a Coltrane that his own record company was barely interested in trying to sell. In the day-to-day life of the band, the next studio session, from April 1963, had the veteran Roy Haynes temporarily replacing Elvin Jones. Some of this material developed in an interview with Gonçalo Frota of Lisbon's Público (www.publico.pt). I am in total agreement with the author. From my vantage point I have to say I believe that the state of jazz music and it's audience is where it's at because of the influence of jazz education and the lack of auto-didactic influences from up and coming musicians. Once Wynton Marsalis was hailed as the new messiah back in the 1980's and his backward looking influence became the model for young musicians, band directors, and the jazz education industry we lost a core building block and direction in jazz and improvised music...innovation. Even though some younger players escaped this shift and went on to evolve into the 21st century improvised music scene, the vast majority did not. Even if the young musicians dabbled in newer forms and sounds they remain tethered to "THE TRADITION"! To see this at work you need to go no further than the vast majority of university jazz programs and see the emphasis on big bands and recreation of music mostly from the 40's, 50's and early 60's. The 1950's are now almost 70 years old and a lot has taken place in jazz/improvised music but you wouldn't know it by visiting most jazz programs at the high school, and university level, and this is where today's jazz musicians are coming from. Well said Stuart, great review! Excellent review Stuart, and interesting that the album is selling so well. As set out in Ashley Khan’s “The House That Trane Built: The Story of Impulse Records” (Norton, 2006) Coltrane’s relationship with the label evolved quite substantially over the years. As you say, at the outset, ABC-Paramount, the parent company of Impulse, regarded Coltrane as a potential money-spinner – he’d had a hit with “My Favourite Things” on Atlantic. Bob Thiele, the producer who’d taken over at running Impulse, was anxious to record Coltrane as often as possible, and even kept some of the recording sessions secret from his bosses. They sometimes took place with no particular album in mind, but he felt it important to document what Coltrane was doing. Under Thiele’s stewardship, it wasn’t long before Impulse was releasing very different albums from the “Ballads”, “Ellington” and “Hartman” albums you mention. Those all appeared in 1963, but then so did “Impressions”, recorded at the Village Vanguard between 1961 and 1963, and “Live at Birdland” recorded in 1963 and released in 1964. As we know, many more far less commercial albums were released by Impulse right up until Coltrane’s death and beyond. Whatever the views of ABC-Paramount about the material Coltrane should be recording when he was signed to Impulse, things changed quite quickly, and Thiele had to fight hard to get some of Coltrane’s albums released, but he ensured they were released at frequent intervals, and sold well. In the light of this, I do wonder whether “Both Directions at Once” really does reflect a Coltrane that his own record company was barely interested in trying to sell. The parent company maybe, but certainly not Impluse and Thiele. And do we know if Coltrane ever considered releasing anything from this session, particularly given the overlap with the “Impressions~ album? I’m sure that the reason for the delay is simply that the tapes only turned up recently. Otherwise, Impulse would almost certainly have released all or part of the session along with the other material which was discovered in the vaults in the years following Coltrane’s death. All things considered, I'm still not sure whether to buy the CD or not. Being Trane's "disciple" but not a "nerd" and having made a "transition" toward modern free jazz and improv, I relish newly discovered 4CDs Live in Japan and rarely reach for earlier recordings beyond 1964. Is this going to give me "a new thing"? I think there is a potent yet untold story at the intersection of John Coltrane, Bob Thiele, and Impulse! I learned from Yasuhiro Fujioka that in 1964, when Coltrane's record contract was up for renewal, Coltrane reached out to George Avakian to find a label that would be interested in a themed, long-form album (A Love Supreme). Apparently, with the arrival of the Beatles and the dominance of short songs on radio, Coltrane's desire for lengthy performances was a challenge for Impulse! Avakian could not find an alternative label so Coltrane renewed with Impulse! Who then released “A Love Supreme” and other long-form albums. The astonishing thing about Cotrane’s music on Impulse is just how much of it was recorded and released even during his life, in comparison to Ornette, Ayler or Cecil Taylor during the same period.